Create cards, scrapbook layouts, home decor, treat containers, mixed media, etc. 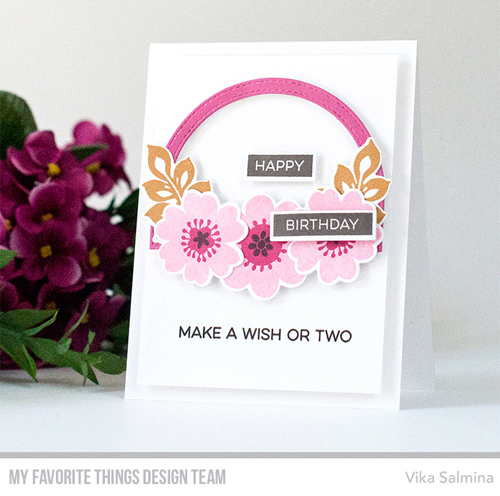 using this color combination and be sure to link your project below for a chance at a My Favorite Things Gift Voucher worth $15. Use whatever supplies you'd like in your interpretation of the sketch but remember, if you use MFT supplies, you can win up to $20! Congratulations, Lavery Grey Creations! You are the randomly selected winner of MFT Color Challenge 68. You can view all the entries from the last challenge HERE. You have until Wednesday, May 24 at noon EDT to add your link and be eligible for the prize of up to $20 in MFT Cash. Winners are chosen at random, so everyone has a chance! The prize is a $15 Gift Voucher to My Favorite Things, but if you use MFT stamps and/or dies in your project, you’ll receive an extra $5. Thank you so much! I'm super excited!! How do I claim my prize?